Natural teeth are porous, which means they absorb pigments from things like coffee, tea and red wine. Porcelain differs from natural teeth because it has a hard, glossy coating that makes it non-porous. This coating gives porcelain several benefits: it doesn’t pick up stain like natural teeth, it reflects light more naturally, and it adds strength to prevent chipping or breaking. 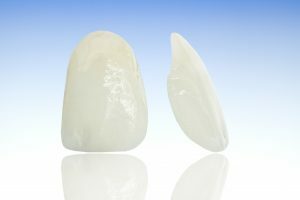 Porcelain is an excellent material for veneers, but like all dental work, it still requires some basic maintenance to look great for as long as possible. How Can You Care For Your Porcelain Veneers? It’s still important to get regular checkups with a dentist in M5R 3K4 to make sure that all your teeth, including the ones with veneers, stay healthy and strong. Don’t chew on anything crunchy or hard like ice, hard candy or pens. Porcelain is strong, but these habits might cause chips. The best way to maintain the shiny coating on your veneers is to use gentle products that won’t scratch or dull it. It’s a good idea to avoid whitening toothpaste because it has more abrasive ingredients than normal toothpaste. You can also choose a gel formula, which won’t contain harsh ingredients. Since each patient is different and has unique needs, the best way to know if porcelain veneers are a good option for you is to schedule a consultation. You want to correct multiple imperfections – Veneers are a wonderful way to “kill two birds with one stone.” For example, if you have gaps and severe staining, porcelain veneers will mask both at the same time. You don’t excessively clench or grind – Again, although porcelain is strong, it doesn’t withstand clenching or grinding forces very well. If you do suspect that you grind at night, a nightguard may be necessary to protect your veneers. You have reasonably good oral health – Veneers may not work for you if you have advanced gum disease or active cavities, although they might still be recommended if you can treat these issues and achieve good oral health. You have only minor crowding or other types of misalignment – If your teeth are severely crowded or misaligned, veneers probably won’t work until your underlying bite issues are corrected. Dr. Kevin Dann is a general, restorative and cosmetic dentist in M5R 3K4 who makes patient comfort a priority. He loves using porcelain veneers because they provide outstanding cosmetic results that also look great for many years. If you have any additional questions about maintaining veneers, he can be contacted via his website or at (647) 559-3176.